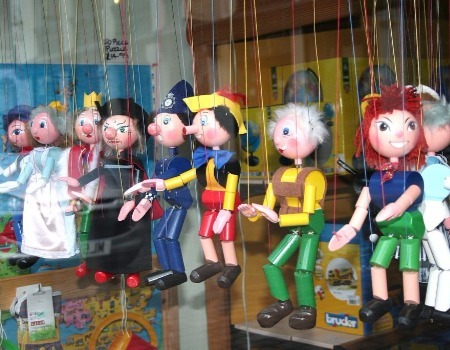 Guest Post: Puppets On A Digital String? This week we’re pleased to once again feature a guest post by John Mikton, who blogs at Beyond Digital. With 22 years’ experience working in Education Technology and 12 years as a Senior Leadership Team member in International Schools, John is perfectly placed to comment on all things EdTech. John is currently the Director of eLearning at the Inter Community School Zurich and was previously the Director of ICT at the International School of Prague. John is an Apple Distinguished Educator and Google Education Trainer, Common Sense Digital Citizenship: Certified Educator and trainer at the Principal Training Center and AppsEvents. This post is inspired by an L2talk I gave at the Learning2 Europe conference in Warsaw. I am sure you’ve heard about B.J Skinner’s rat experiment. The first rat had a lever in its cage, and every time it hit the lever food would come out. The second rat in the same set-up, hit the lever and nothing came out, no food. The third rat, same set-up, when it hit the lever a little food came out, then nothing, and then a lot, and then nothing again. The third rat developed an addiction. It quickly realized as long as it hit the lever it had a chance of getting some food. This is called the principal of variable rewards. That feel-good feeling: the dopamine rush. Behavior design, as explained in this article (Scientist who make our apps addictive by Ian Leslie 1843 Economist October.November 2016), is a critical part of every app development. Tech companies employ behavioral economists, psychologists, and psychiatrists in the creation, design and curation of our app ecosystems to ensure we keep coming back for more. So many of our interactions with devices are subconscious. In Eric Pickersgill’s thought provoking photos series “Removed” (do spend some time on the link!) he highlights the idea of being “alone together” as Sherry Turkle so aptly describes in her book Alone Together. We are often physically together with another person in a space, sometimes even intimately, but our mind is burrowed in a phone. A good example of behavior design is Snapchat and the new feature “streaks“. The idea of streaks if you have a dialogue with a friend over 24 hours and you continue this over days, a flame emoji shows up. In tandem a number counting your interactions keeps tally. Should one of you stop posting, an hour glass shows up giving you a heads up that the streak will disappear if you do not stay on. For adolescents social media relationships can be a gauge of their social capital. Streaks add a layer of complexity to the interactions. It is a fact that our online data (health apps, social media, travel, online games, GPS, shopping, search etc…) is collected, analyzed, and then sold to third parties, or curated to give us a personalized online experiences with the clear goal of manipulating our behaviors. We as educators have an ethical responsibility to be skeptical of behavior design’s narrative. Let us challenge our learning communities to question the complexity and consequences of behavior design in our lives. Stuffing a digital citizenship lesson for 15 minutes during a Friday morning advisory is not enough. We need to make this narrative an integral part of the living curriculum. If we ignore behavior design we will lose something. Free will. Surely neither you or I want to lose this?